Biological Physics focuses on new results in molecular motors, self-assembly, and single-molecule manipulation that have revolutionized the field in recent years, and integrates these topics with classical results. The text also provides foundational material for the emerging field of nanotechnology. Biological Physics is built around a self-contained core geared toward undergraduate students who have had one year of calculus-based physics. Additional “Track-2” sections contain more advanced material for senior physics majors and graduate students. 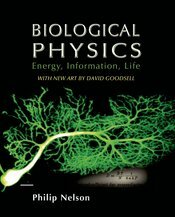 Philip Nelson's excellent text, Biological Physics, provides material for the types of course we should now be offering to all our students."